Please don’t buy this product. Instead, please buy its successor “Divi Sensei Before After Slider” here on Elegant Marketplace. 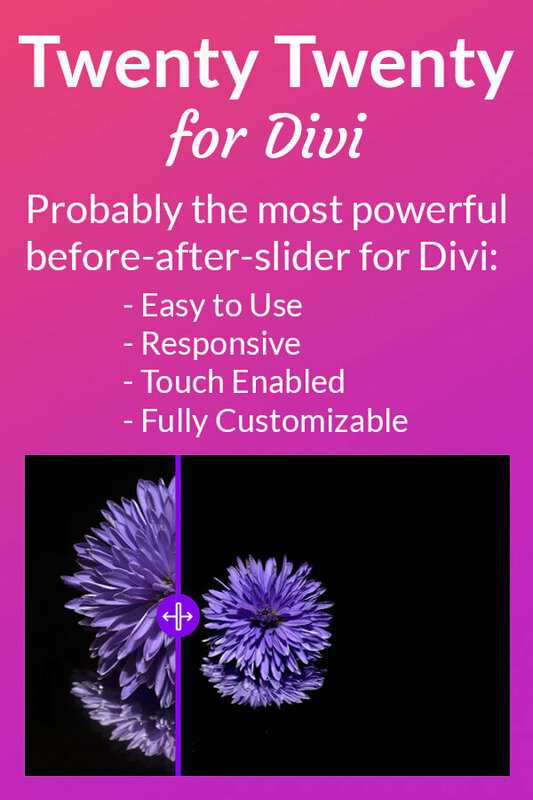 Twenty Twenty for Divi is a before-after-slider and the perfect solution if you need to compare two images. Instead of displaying them side by side, you can now use the Twenty Twenty Module to get a responsive, touch enabled before after slider which you can drag horizontally or vertically to reveal and hide the after image over the before image. The module is fully customizable and stylable with color pickers, range sliders and so on – and if thats not enough: there are custom CSS fields for every element as well. Twenty Twenty for Divi is super simple to use and comes with a nice looking default layout so you can start comparing images right away. Whether you want to show of your photo editing skills or teach customers how to distinguish your products from counterfeit – the possible use cases are endless. You can find the installation guide, the documentation and our support contact form at the bottom of the demo page. Be aware that Elegant Marketplace can’t improve the module or fix bugs so if you need help, contact us via the contact form. At first, I encountered what must have been a bug due to a Divi update but Jan solved it immediately and now it works very well. If I purchase a single site license and decide to upgrade to an unlimited license, can I be credited for the single on the unlimited purchase? Checkout the documentation first and if you still need help open a support ticket. You may install this product on the number of websites appropriate to the license you have purchased that you build for yourself or your clients. You may not install any of these products as part of a hosting offering. Any abuse of these license terms will result in the termination of your account and the licenses that are attached – no refund will be offered or awarded in such cases. You will receive 6 months support – premium support charges may be incurred after this period. Updates are for the life of the product. We understand that there can be issues whilst utilising out of date browsers. Please ensure you use up to date browsers when using our vendors products. Third Party Plugins may not perform as desired in the Divi Visual Builder. This is an issue that we cannot fix due to the restrictions put upon us by Elegant Themes lack of Divi Developer Documentation. Please be aware that you will need an amount of experience in Divi Theme and WordPress to take advantage of our themes and plugins. Please make your decision to purchase based upon your skill level to see if our products fit your needs. Due to the nature of Digital Downloads, Refunds are not possible – please ensure that the product you are buying will do the job you want it too. All support for products is handled by Vendors and contact details will be included in the download packages. If contact details are not found within the files, please do contact us and we will be happy to put you in touch with the vendor concerned. BEFORE YOU ASK US FOR DIRECT SUPPORT – READ THIS! *Support is provided by vendors directly. You have questions about your purchased plugin, theme or layout? Then use this form to get your answers as soon as possible. If you have a license key, please enter it here. You can find it in your account under "view details and downloads". Otherwise, please use the invoice id from your invoice. Join our mailing list to receive the latest news and updates from our team and a 15% discount code on all products you can add to your cart as a thankyou gift. The author will normally get back to you within the next 48 hours. All requests are processed one after the other. If you do not receive an answer within this time, please check your spam folder and make sure that you have entered the correct email address. Upload some screenshots showing the problem (optional) Select File Please submit some screenshots showing the problem. The JPG and PNG format and several files are allowed (optional).